I don’t know if you recall that a while back I was feeling distant from God due to all the changes we’ve been experiencing in our lives. I was feeling a real need to find a way to connect to God. 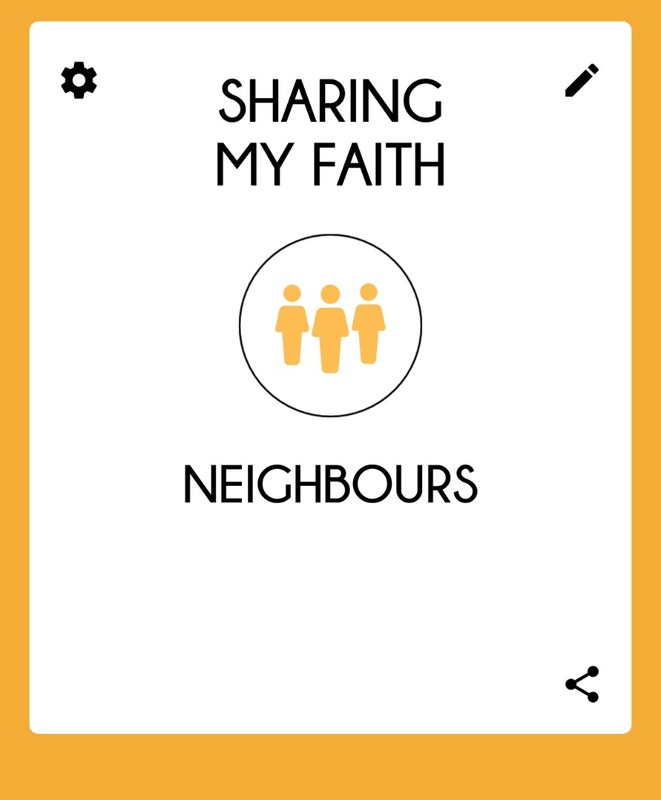 Hubby suggested that I use an app called PrayerMate. It sends an reminder to pray which “isn’t all demandy or in my face” but just an encouragement to keep praying about the things that are important. Let me walk you through how it works. You can choose others or create your own lists. Then each day a list to pray through is created for you. And a reminder is sent. My reminder comes at night around 8 p.m. Five items are chosen from my lists to pray for, never two from the same list. Today I would be praying with Paul, growing more like Jesus, praying for my lad, praying for the church, and for a missionary family. This list changes from day as you can see from my image below. Some of the prayers are quite long, causing you to scroll down the page. They are all easily readable, and you can either pray them as is or reword as needed. 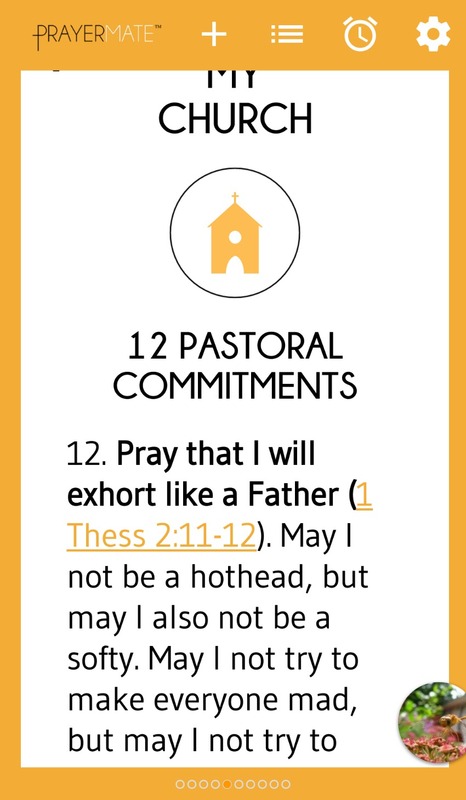 I really like that I can add things in that I want to remember to pray for. For instance I have days that I pray for my neighbours, people on the crew, my family of birth and so forth. I can’t say it’s perfect, it isn’t.. because I (yes me) am so not perfect. It sends reminders and there are days I just don’t take the necessary time. BUT if I do choose to use it my prayer time can last as little as five minutes or as long as 20, all depending on what the Lord lays on my heart and how much I just need to talk to go about the good things and the hard things in life. My hubby first learned of this app through Challies. You might wish to read his review of this helpful app as well. You can also learn more about it here. 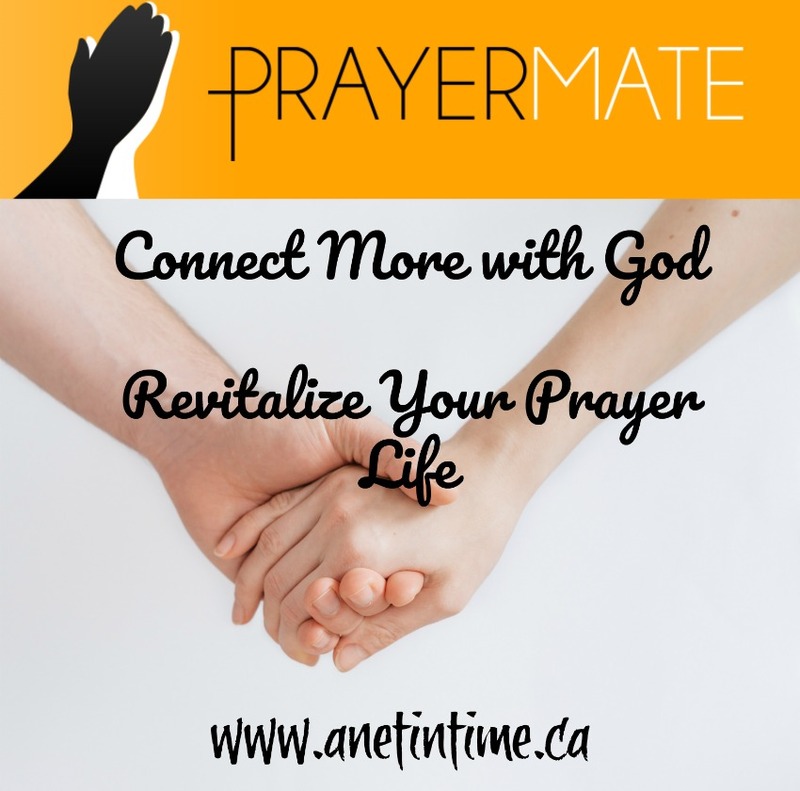 I encourage you to get this app, you will find it invaluable for helping you pray more effectively and also just to remind you to take the needed time to connect with him. Not just a “give me give me” but a thank you for all the many things the Lord provides us with. 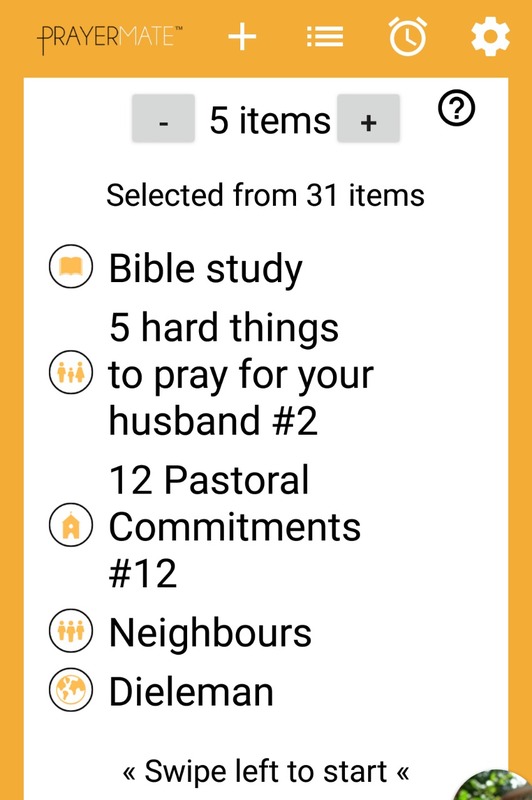 Find PrayerMate here. Just go.. fly away cause you know what? So let it fly, just fly free. Those are the words that popped into my head when I saw the word Release. Miss Kate is so diligent about giving us a word to write on every week. Come join us won’t you? That is what the word release means to me. Like a bolt released from a crossbow speeds away. Ants to feed, games to play, a dad to touch base with. Yell and shout and bump and fly. Find a way to express yourself and just be free. With a squeak and hop twisted out of her grip. Who found a crevice to slide away into. Today I learned a distant friend’s father had passed away. His son said “Today my father is released. Able to see the Lord finally, face to face”. Has the meaning of Easter changed your life? 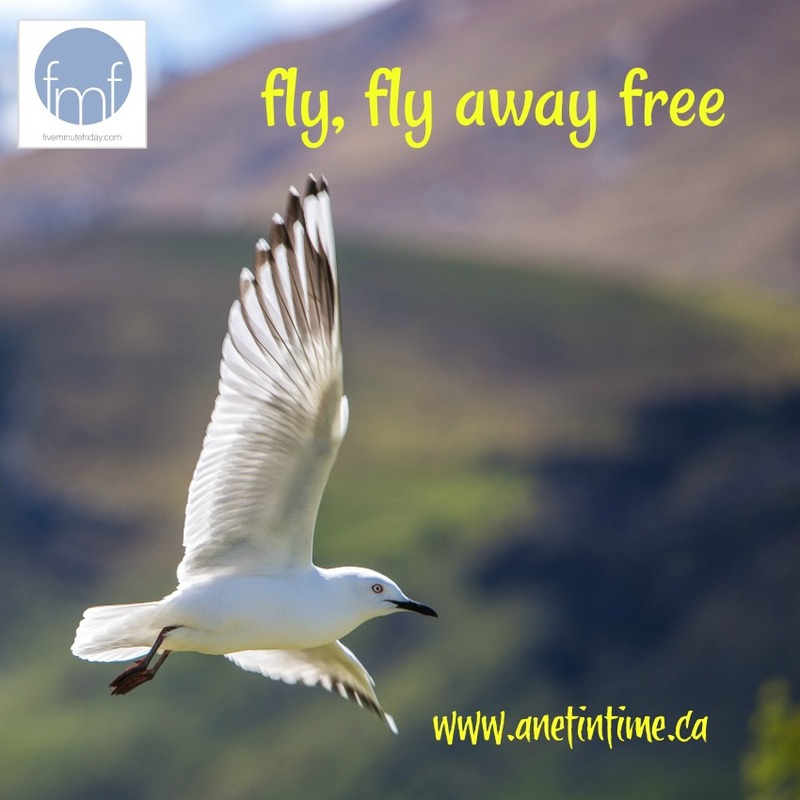 And fly, fly away free. Over the past several Thursday’s we’ve been considering Mary and Martha and the lessons they have to teach us. Did you know that this story is sandwiched between the story of the Good Samaritan (that reminds of our relationship with each other) and the Lord’s Prayer (that reminds us of our relationship with God)? I have to say that I hadn’t really thought of that before it was brought up in Having a Mary Heart in a Martha World. To think of the balancing act it is in our service to God and our service to people. Don’t you find it hard sometimes? I think about how sometimes families will leave the worship service early during church so they can go out and prepare coffee. The coffee needs doing, but the worship needs happening too. Or when an Easter Son-rise service is happening and a good portion of the “helpers” are out of service getting it all ready. Which admittedly is wonderful! I love the breakfast and how quickly it is ready, and I love helping with the clean up afterwards, but sometimes I wonder is the not coming to worship worth it? How do we balance the spiritual and physical? Both needs are real. Both goals are great. They both need to be met. It is so easy to just focus on one or the other at times in our lives. I have to admit that I am no expert. I struggle with how much to do and when to do it. It’s a battle to see the needs…like for instance the lad and I work on the foodbank once a week. He does his schooling and helps wherever he can when called upon, and I work with clients and keep things organized. And sometimes I wonder if it makes a difference, or if when my week is busy if I should just cancel it, or what. It’s not always an easy fit you know? And then I look at this week and how I’ve managed to have devotions once because life has been a bit more hectic this week than I would have planned and so my worship of God, my service to God has suffered. The balance just hasn’t been there this week. How Does One Maintain Balance? 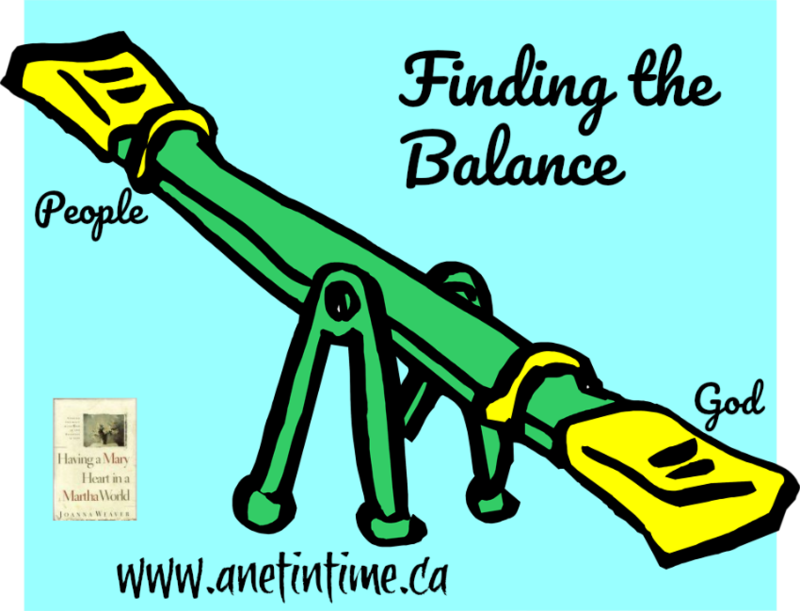 It leaves me pondering…how does one maintain balance? Needing to plan out my life just a bit more. To be able to say I have this and that and that thing to do, so how do I fit in my must, my need, my want, my desire in-between it all? Planning. Noting the big things in your life and making sure the important gets done and working the rest around it. Spiritual inventory. Taking note if you are feeling stressed or downcast or off-kilter. Are you spending your time wisely? Reaching out to God? Talking to him? Learning from him? Sharing of yourself with those around you? Rest. Are you taking a day to just rest. Seriously.. God gave us a day of rest for a reason. TAKE IT! Spend time chilling, spend time with your spiritual family, Spend time with the people important to you. Take the rest. Remember who your centre is… always circle back to Christ. Remember that he is the strength behind anything we do. Whether it is service to our fellow beings or service to God. Without Christ as the wind beneath our sails none of it is truly possible. I think that I might have learned it from the Psalty tapes that were so popular when I was in college. 🙂 I honestly loved those tapes. The stories interwoven with songs. I listened to them over and over again. Today’s word prompt from Miss Kate is routine. A regular Friday post where we write for five minutes on a word prompt without stressing about editting or being perfect. 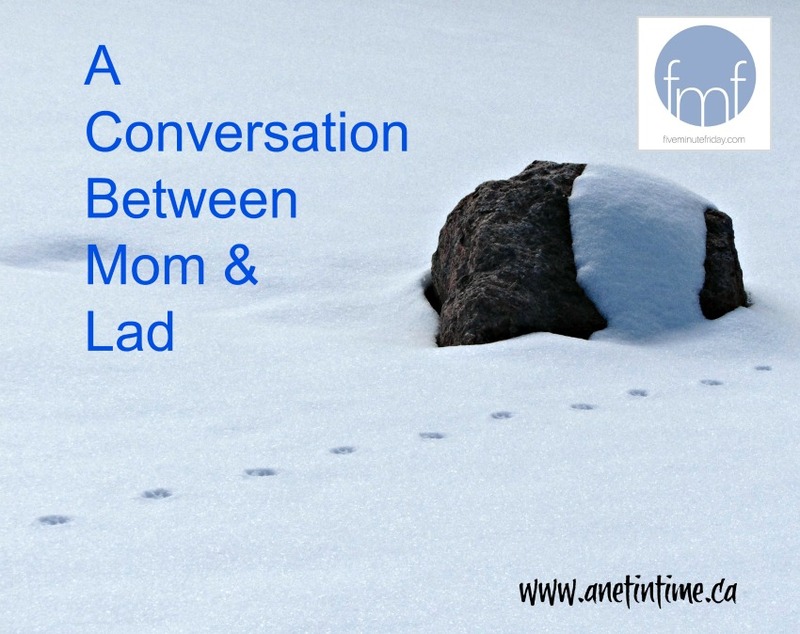 The other day my lad and I were chatting as we set out to go to the foodbank. Talking about how to get up on time and what not. We got to the foodbank and needed to let that conversation rest, but the lad picked it up on the way home again. Why is it important mom? What you said earlier.. why is it important? Well, because it’s better for me to pray regularly. It’s good to have that routine and rhythm to life. But why are you using a thing on your phone? Oh, because sometimes a person needs help. Like when I made that chart for you, to help you establish good habits? Remember how you told me it helped you? Oh yes, it’s very helpful. I’m glad you did that for me mom. So does that prayer app help you then mom? Yes. AND because I have on it to remember to learn from God, I am able to remember to do my devotions or good book reading too. Oh! That helps you mom? Yes. It’s a good thing to remember not only to talk to God but to listen to him too. Then we got home and our conversation ended with the settling back into our day of talking with Dad about his orientation being postponed. And conferring with the lad over what schooling should happen yet. But you know what happened two days later? “Mom, did you remember to pray? Jesus, Mary, Martha and Lazarus. People who loved each other. Mary, Martha and Lazarus knew that Jesus could do amazing things. Ergo, when Lazarus got rather ill they sent a message to Jesus. My guess is they hoped that Jesus would come and make Lazarus better. But Jesus didn’t come. In fact he waited two days before he went to be with them. Jesus said that the illness wouldn’t end in death and would be the God’s glory in the end. I wonder if his disciples thought that meant the Lazarus would die. That everything would turn out great. It’s hard to know right? We aren’t told in scripture what they thought. A person can wonder a bit. What we do know though is that Jesus didn’t do what was expected. Jesus tarried. He had a reason, though he wasn’t explicit when he talked with the disciples, other than to say he died “and for your sake I am glad I was not there, so that you may believe“. Honestly, if I had been in the disciples shoes I would have been very curious. How could the death of Lazarus affect my belief?? I can imagine the heart break of Mary and Martha though, knowing the Jesus was close enough to come, yet knowing that he didn’t. Seeing their brother die. How difficult that must have been for them. 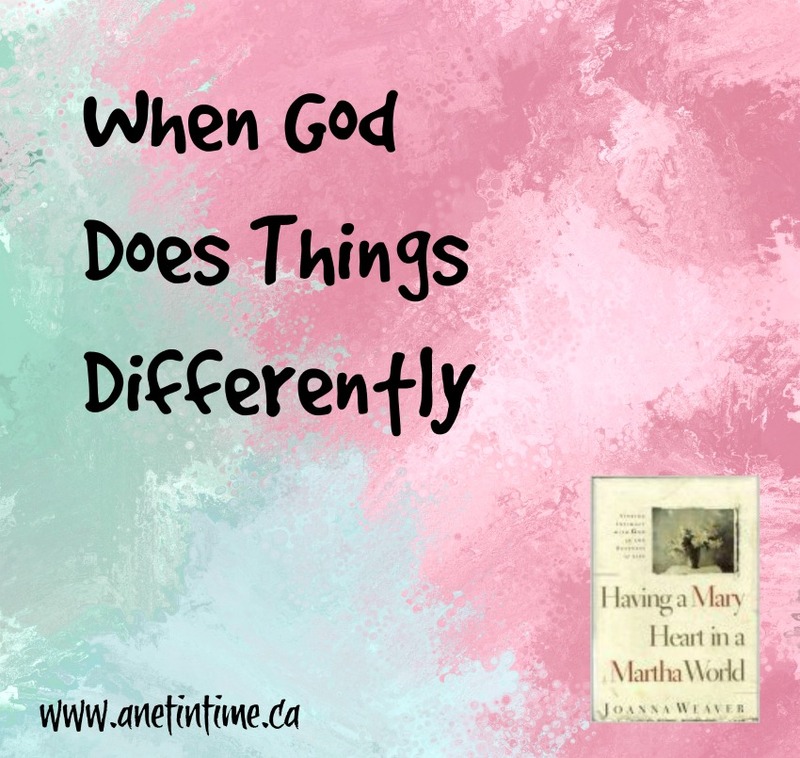 I found it fascinating to read this sentence “So when Martha heard that Jesus was coming, she went and met him, but Mary remained seated in the house. ” We’ve gone from Mary sticking close to Jesus wanting to learn from him to Martha going to Jesus while Mary stayed behind. Martha talking with Jesus, acknowledging that Jesus could have saved him…and then the joy of seeing Martha’s faith…knowing the Lazarus would be raised again. Therefore we know that Martha at least knew that Jesus could have saved Lazarus, but he chose not to. He chose to tarry while Lazarus died. For What Reason Could God tarry? What do we do when we expect God to do something and it seems like he is just tarrying. Waiting to show up after it’s too late? How does one understand that? We know that God’s plan was Lazarus’ illness end in his glory. The biggest realization we need to come to is that sometimes God has a good reason to tarry. It can be to show for his glory at a later date. Jesus alluded to the fact that Lazarus’ death would increase their faith. This tells us that the Lord tarrying could be a matter of helping us by increasing our faith. Causing us to need to trust him all that more. God’s ways are higher than our own. We can’t always tell why God acts as he does, but he always has a reason. What can our response be? What should our response be when it seems like God tarries? Remember who God is, recall to mind what you know of God. Remember a delay is not a denial. It’s just a waiting period. Know that when God is ready, when the time is right, he will reveal what is meant to be. Jesus met Mary and Martha where they were at. Seeing their pain and misery. Weeping along with them. When Jesus saw her weeping, and the Jews who had come with her also weeping, he was deeply moved in his spirit and greatly troubled. 34 And he said, “Where have you laid him?” They said to him, “Lord, come and see.” 35 Jesus wept. See when we are waiting, Jesus isn’t ignoring us. He knows where we are at. But look at what happens, see what happens next! He doesn’t leave us there. See look… look! What do you think that did to Mary’s faith, Martha’s faith or the faith of the disciples? To see God in action like that? Wouldn’t it have just blown your mind? To see Lazarus walking out of that tomb in response to a call from the Lord Jesus Christ? Now Jesus did challenge them to have faith, to believe him. He told them if they believed they would see the glory of God. AND THEY DID. They opened the tomb. They saw Lazarus walk out alive. Their faith was strengthened. The tarrying of the Lord had good reason. Take heart! When the Lord tarries, there is good reason for it. Do you remember from last time how to the people watched Ezra’s grief and prayer and how they committed to change and followed it through with deliberate action? Today we read from Ezra 10:18-44. 18 Now there were found some of the sons of the priests who had married foreign women: Maaseiah, Eliezer, Jarib, and Gedaliah, some of the sons of Jeshua the son of Jozadak and his brothers. 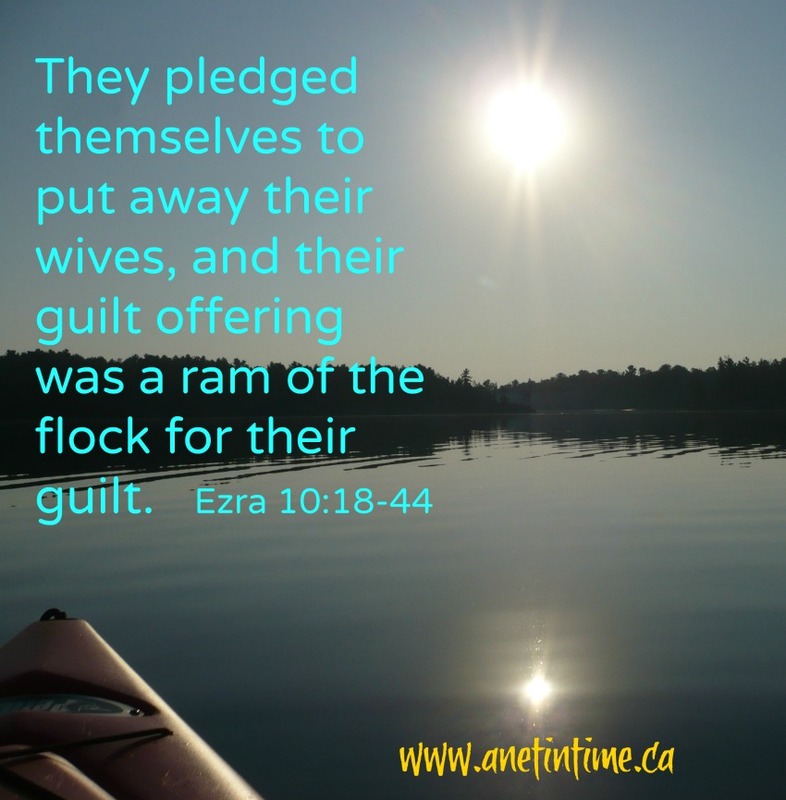 19 They pledged themselves to put away their wives, and their guilt offering was a ram of the flock for their guilt. 20 Of the sons of Immer: Hanani and Zebadiah. 21 Of the sons of Harim: Maaseiah, Elijah, Shemaiah, Jehiel, and Uzziah. 22 Of the sons of Pashhur: Elioenai, Maaseiah, Ishmael, Nethanel, Jozabad, and Elasah. 25 And of Israel: of the sons of Parosh: Ramiah, Izziah, Malchijah, Mijamin, Eleazar, Hashabiah, and Benaiah. 26 Of the sons of Elam: Mattaniah, Zechariah, Jehiel, Abdi, Jeremoth, and Elijah. 27 Of the sons of Zattu: Elioenai, Eliashib, Mattaniah, Jeremoth, Zabad, and Aziza. 28 Of the sons of Bebai were Jehohanan, Hananiah, Zabbai, and Athlai. 29 Of the sons of Bani were Meshullam, Malluch, Adaiah, Jashub, Sheal, and Jeremoth. 30 Of the sons of Pahath-moab: Adna, Chelal, Benaiah, Maaseiah, Mattaniah, Bezalel, Binnui, and Manasseh. 31 Of the sons of Harim: Eliezer, Isshijah, Malchijah, Shemaiah, Shimeon, 32 Benjamin, Malluch, and Shemariah. 33 Of the sons of Hashum: Mattenai, Mattattah, Zabad, Eliphelet, Jeremai, Manasseh, and Shimei. 34 Of the sons of Bani: Maadai, Amram, Uel, 35 Benaiah, Bedeiah, Cheluhi, 36 Vaniah, Meremoth, Eliashib, 37 Mattaniah, Mattenai, Jaasu. 38 Of the sons of Binnui: Shimei, 39 Shelemiah, Nathan, Adaiah, 40 Machnadebai, Shashai, Sharai, 41 Azarel, Shelemiah, Shemariah, 42 Shallum, Amariah, and Joseph. 43 Of the sons of Nebo: Jeiel, Mattithiah, Zabad, Zebina, Jaddai, Joel, and Benaiah. 44 All these had married foreign women, and some of the women had even borne children. When I first saw this list I thought… oh yippee… it’s a bunch of names of people I don’t who they are. Big yip. I’m sorry… it’s hard for me to get excited about a list of names. Then I took a closer look. Do you see who some of these people are? This sin of marrying foreigners, of marrying people not of God, wasn’t just confined to the common folk but had found it’s way into the leadership and the church. Or maybe it started with the leadership and the church and worked it’s way down into the common folk. Either way, it was a pervasive sin. And the people set their wives aside. They followed God’s will from the leadership down to the common folk. EVERYONE in the land made the decision to be obedient to God. Doesn’t knowing that make reading a list of names a good thing to do? It’s seeing families change….did you read the list of sons who had committed this deed? Sons that now would be following God more closely? I am sure there would have been pain involved in doing so.. cause “some of the women had even borne children“. Can you imagine having to say good-bye to them? Some hearts would have been badly bruised I’m thinking in this step of obedience. God calls us though to fully be HIS people. Not a divided one. We need to remember that. I need to remember that.